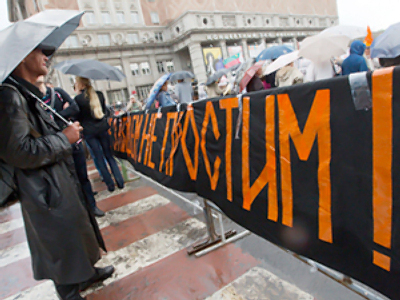 The first opposition rally permitted by authorities in a long while has been held in Moscow. The protest was against the dispersal of the Dissenters March on May 31, which resulted in clashes and arrests. About 200 people took part in the gathering on Triumfalnaya Square in central Moscow on Wednesday evening, RIA Novosti reported. One person was detained, Interfax writes, as he was unfolding a poster stating opposition leaders' incomes. Police were asked to lead him away in order to avoid provocations. 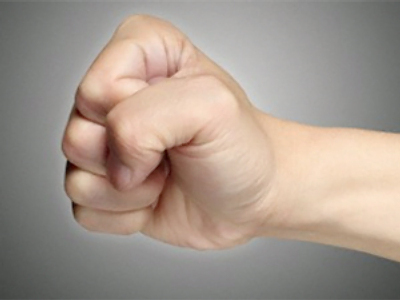 A punch-up occurred before the man was taken away. No other incidents were reported. 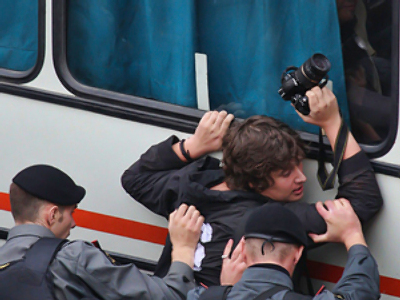 As part of the action, a street photo exhibition was opened presenting 46 images taken on May 31, when human rights activists attempted to hold a rally in support of Article 31 of the Russian constitution. The article provides for the freedom of assembly. Police violently broke up the protest, which was banned by the capital’s authorities. Over a hundred people were detained. Participants of Wednesday’s meeting, entitled “May 31 – we will not forgive”, were holding placards stating “There are no police in Moscow”, calling for the dismissal of the interior minister, Rashid Nurgaliyev and demanding investigation into the police’s violence. According to Russia's human rights ombudsman, Vladimir Lukin, law enforcement agencies were acting “extremely toughly and rudely” when breaking up the rally. The rally at the end of May – known as March of Dissenters – was the latest in a series of meetings organized by human rights activists and the opposition. However, each time the gathering has been dispersed, having been banned by authorities. The protesters were also handing over copies of a new book “Putin. 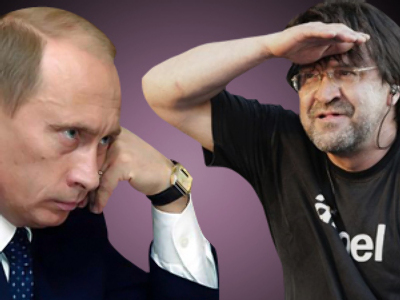 The Results: 10 Years On” written by opposition leaders Boris Nemtsov and Vladimir Milov. The 48-page report aims “to tell the truth about what is happening in Russia, dismantle myths implanted by the powers that be, and bring the truth to the citizens,” the introduction reads, as published on the opposition website. 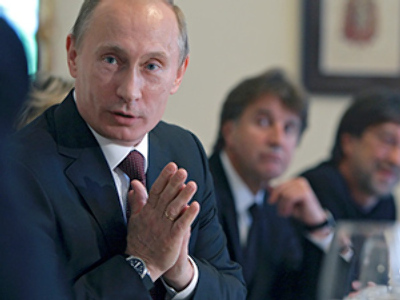 A million copies of the brochure – highly critical of the current Prime Minister Vladimir Putin – were published, to be distributed for free in Moscow and other Russian cities. 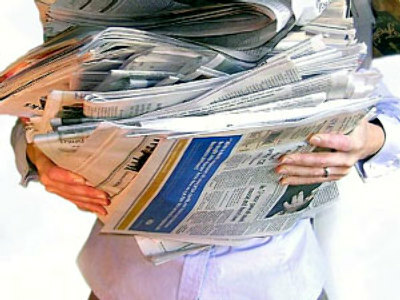 On Wednesday, a hundred thousand of copies were seized by St. Petersburg police. The activists were planning to hand the book out at the International Economic Forum, which is underway in the northern capital. The driver of the vehicle that was to deliver the brochures to the city was reportedly detained by police for administrative offences and the books were confiscated. The brochures were later delivered to the Center for Countering Extremism, where an analysis will be carried out, Maksim Reznik, the leader of the St. Petersburg branch of the Yabloko party told fontanka.ru. Meanwhile, the ombudsmen of Penza, Bryansk and the Republic of North Ossetia have all criticized Russian Human Rights Commissioner Vladimir Lukin, RIA Novosti reports. They sent an appeal to President Dmitry Medvedev asking to examine and evaluate his activities. They claim Lukin “takes a selective approach to observing human rights”. Penza region ombudswoman, Svetlana Pinishina, said he pays too much attention to political issues, supporting the opposition, thus turning the work of a human rights activist into a political campaign. However, later Valery Tsomartov, the North Ossetian ombudsman, stated that he had not signed any appeals concerning Lukin, Ekho Moskvy radio station cites him as saying.